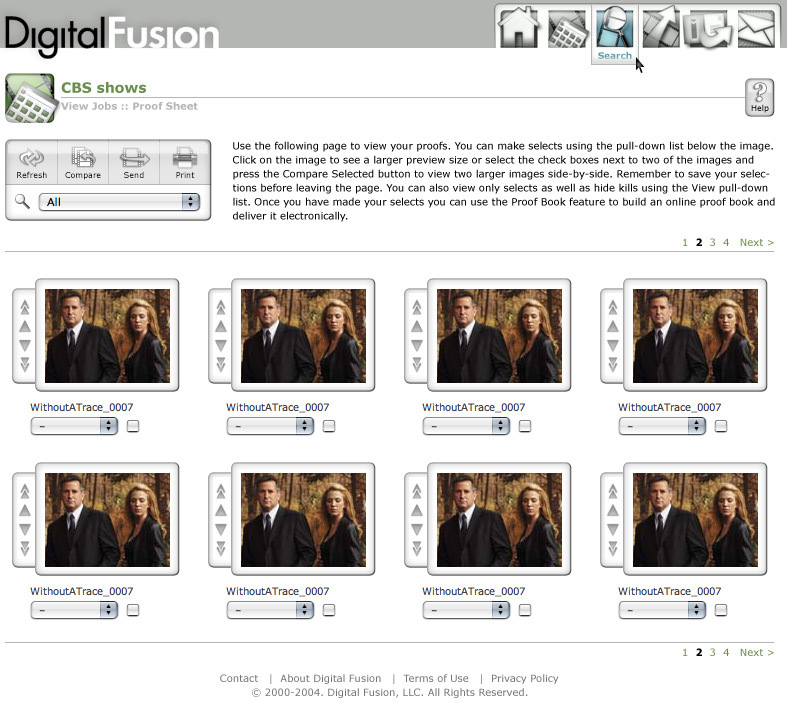 DigitalFusion is a digital photographic rental and post-production facility based in Los Angeles, California. Their goal is to help professional photographers evolve from conventional film photography to digital photography by providing a digital replacement to the typical photographic workflow. Pleased with the results of those two web sites, DigitalFusion invited me to be a part of a very exciting project: the third incarnation of their flagship software application, DF Studio. DF Studio is a web-based program designed for professional digital photographers as an editing and job management application. It creates a powerful and collaborative workflow for the photographers and their clients. 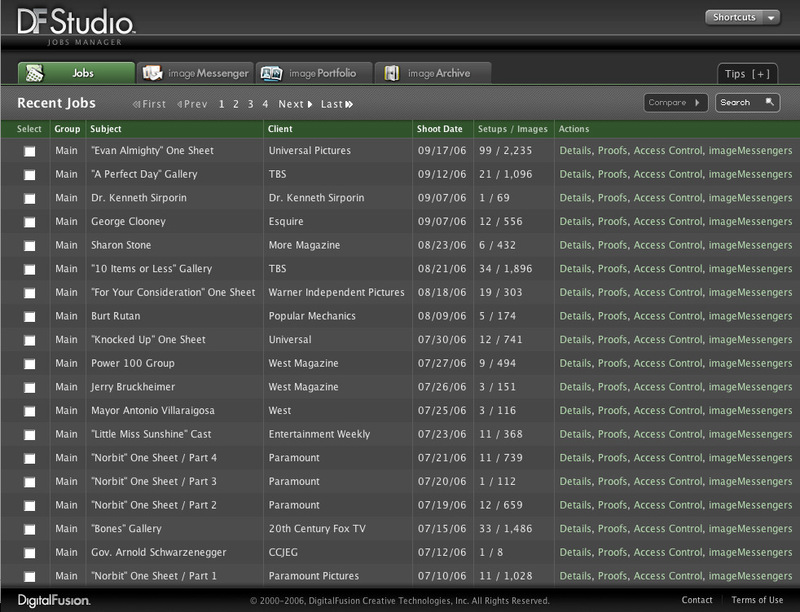 In April 2006, I started working on the new version of DF Studio as part of a small web development team. My role in the project was a major overhaul of the UI (user interface). This visual upgrade involved realigning the web application to use modern web standards since the new design required a solid foundation of valid HTML markup. For example, where the previous version used tables for layout, the new version sports a CSS-only layout. These changes opened the door for new user-specific features such as background color choices, layout sizes, and much more. The power of the CSS-based design is that these various flavors and ways to view images inside the application are all drawn from the same source code files. Below is an example of the old jobs index page, and next to it the new one (these small images link to the full-size version). The meat-and-potatoes of the application is image management. The post-shoot workflow includes uploading images, selecting images, communicating selections and edits to the client, and receiving feedback. I dedicated a large amount of time and energy to this part of the application, and I feel that it shows the power of CSS-based design. People viewing and managing images can change layout size and type, background colors, and toggle on/off different features. In the previous version, the only background color was white; now the default is black, but white and several shades of grey are just a click away. Examples of the DF Studio proofsheet layout (old is first, then new—click for larger versions). Image selection and management can also happen in full-size image mode. Changes to this part of the application included minimizing the header/footer areas to show more of the main image, and the addition of a thumbnail row across the bottom. The row helps navigate the current collection of images, rather than just moving back and forth with arrows and seeing each large image one at a time. Screenshot of the new DF Studio proof (medium size image) layout. Along with DF Studio version 3, the DigitalFusion development team is launching new upload tools and a plugin for Apple’s Aperture software. My talented friend and colleague, Sam DeVore, is responsible for those two projects (with more to come). Launch Date: November 2, 2006 at PhotoPlus. 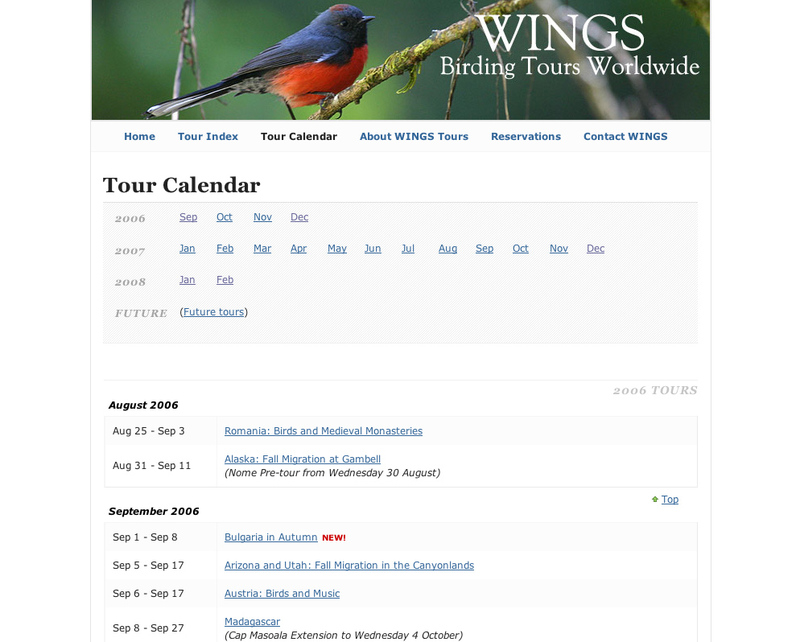 simpledream web studio is very proud to announce the newly revised wingsbirds.com, home to WINGS Birding Tours Worldwide. It was a large undertaking—ten months in the making—as well as a fun and challenging project. The goals of this site realign included modernizing the behind-the-scenes workflow at the company, bringing the code up to current web standards, and realigning the visual layout to improve readability, accessibility, and cross-browser performance. As an added bonus, the cosmetic changes provide a better showcase for WINGS‘ spectacular collection of photography. The WINGS site is very content-focused, and my intention was to allow the content to engage the visitor. The design is simple and clean, readable and friendly. See older versions of the site for comparison. Creating an administrative interface for WINGS staff to edit the site content online was the project’s biggest challenge. Previously, all the static HTML pages were generated in Word, Excel, or Adobe GoLive and then sent via FTP to the web server. The ability to update the quickly and easily was an important change. The new site uses CakePHP, the rapid development framework inspired by Ruby on Rails, not only to serve the public part of the site from database-driven templates but also to create the administrative interface for content editing. I partnered with Sam DeVore of TeachesMe.com on the CakePHP work, and he did a marvelous job implementing the CMS and programming both public and admin sites. Sam’s advice and development expertise were influential in the overall success of WINGS‘ new site. The administrative part of this project will continue to evolve, but for now the public pages speak for themselves. 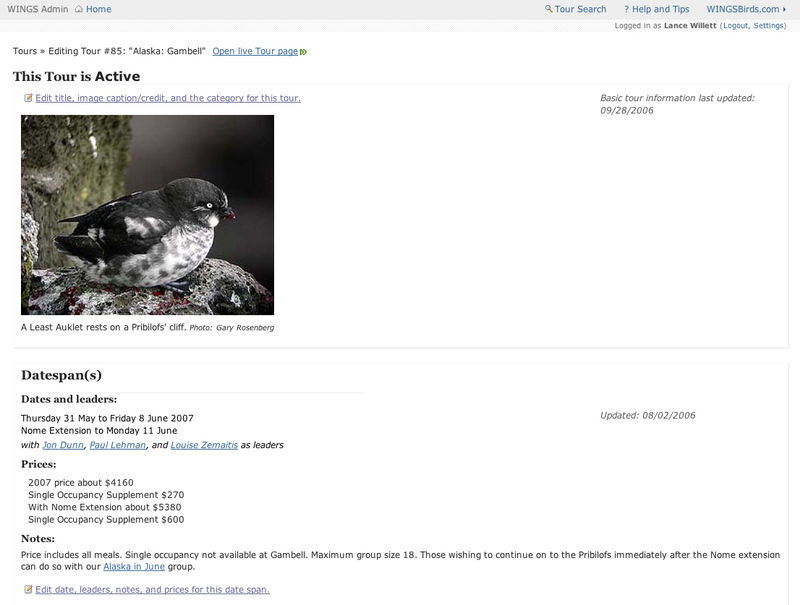 Explore the web site and get a taste for the amazing amount of quality content such as photo galleries, narratives, and bird lists. Work Done: Two projects in one: the public site realign and the CMS administrative site creation. Both projects included graphic design, front-end coding in XHTML/CSS/JS, PHP programming, and content migration from thousands of static HTML files into the new Content Management System (CMS).